All new parents want to help their babies learn and grow into bright imaginative children. Educational toys are popular additions to baby shower wish lists, with many expectant parents browsing stores and websites for information on the best choices. Babies come into the world ready to learn and it is up to their parents and other carers to provide intellectual stimulation. Toy designers have come to learn that consumers want and expect toys that are more than entertaining; they want toys that will encourage the physical, social, and cognitive development of babies and children. Babies utilise all of their senses in learning, so toys that are the most interesting will often appeal to one or more of the basic five senses. Sight: Brightly coloured toys with bold designs are sure to grab the attention of little ones. Moving parts are often fascinating to young babies, as are toys with human-like faces. Sound: Toy manufacturers offer an ever-growing selection of electronic toys, some with music while others strive to teach first words. Touch: Babies are tactile learners, so books that feature textured pages are often appealing to babies. Fuzzy pages with bunnies, and rough sandy pages showing beach scenes are good choices for growing little minds. Smell: Most toys are designed to stimulate the above three senses, but there are books available with scented pages to help children associate aromas with objects. Manufacturers of baby dolls often utilise scents as well. Taste: While toys themselves do not have "flavours," all parents know that babies like to put things into their mouths. In fact, that is typically the first thing that babies do with every object that gets into their hands! Interacting with babies while they play is important for their social development, but parents must be careful not to "direct" babies' play, but encourage little ones to explore and utilise their inherent creativity. There aren't necessarily "right" and "wrong" ways to play with toys, as long as babies are safe, it's a good idea to allow them to find various ways to use their toys. 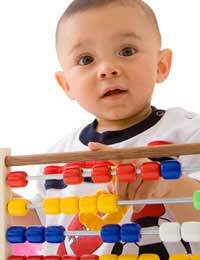 In fact, most of the best toys for developmental advancements are those that promote creative thinking. Blocks, balls, and baby dolls may seem basic and old-fashioned, but they all encourage babies and children to decide how they will be used. Playthings that simply require that a baby pushes the same button repeatedly are not likely to be of interest for very long. Once available exclusively at specialty shops, educational toys are now readily available at most mass merchandisers as well as online. In the UK, Brainy Days Educational Toys is an online retailer focusing their stock on toys designed to encourage the healthy growth of babies and children, carrying a number of award-winning toys from manufacturers like Orchard Toys. Information available on Brainy Days' site states, "Orchard Toy's products assist to stimulate young children's imaginations, promote social and verbal interaction and encourage literacy, numeracy and hand-eye co-ordination skills." Such assurances can be helpful to parents as they decide on purchases for their little ones. Babies and young children are natural mimics and learn a great deal from watching the people in their everyday lives. Parents can take advantage of this characteristic in their little ones by looking for opportunities to make their interactions into valuable learning experiences. Providing babies with an assortment of plastic bowls and wooden spoons to play with on the kitchen floor as Mum and Dad prepare meals, encourages babies to stir and "cook." They will likely also stack the bowls, both nesting them and making towers, will place them on their heads to make silly "hats," toss them about, and may try to engage their parents in an impromptu game of "peek-a-boo." All of those activities help to develop a baby's sense of imagination and creativity while encouraging their physical, social, and cognitive development. There is nothing wrong with seeking and buying toys that manufacturers label as educational, but parents should realise that opportunities to offer their babies rich learning experiences are abundant, often by simply choosing to include their babies in the things that the family is already doing.